The BioWare countdown first came to light late last week when a six-day countdown clock appeared on the studio's main site as well as the Dragon Age and Mass Effect websites. Speculation ran hot: Some suggested it could be the official opening of The Old Republic beta, while others called for a Mass Effect 3 announcement. But when the clock finally ticked to zero mere moments ago, we got something else entirely: A site crash. Yes, that was BioWare's big moment: A big, fat kablooie. The official BioWare Twitter reported, "Servers crashed, huge views on our sites. Working to get them back up. Stand by ASAP." Nice job, guys. Not that I want to be overly harsh about this, but I can't help but think that somebody should have seen this one coming. If you're going to start a big, super-secret countdown and get all the Dragon Age and Mass Effect fans worked up into a lather, then you should be ready when a bazillion of them are staring at your website waiting for zero hour. Otherwise, you end up looking just a little bit silly. UPDATE: BioWare is back and now, as promised, the real truth is revealed! 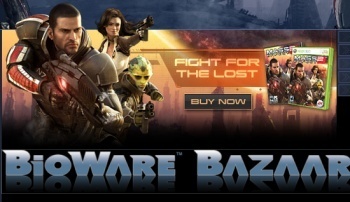 To mark BioWare's 15th anniversary, the company is holding the BioWare Bazaar, a series of "mock online auctions" with more than 400 prizes on the block, ranging from stickers and posters to unique items like Mass Effect 2 and Dragon Age: Origins branded PCs and Xbox 360s. Instead of cash, the auctions will make use of tokens, which can be earned by signing up for BioWare's social site, registering games and responding to timed challenges posted on BioWare's Twitter feed. The first Twitter challenge is already up and it shouldn't prove too complicated: Just name your favorite Dragon Age: Origins character. The auction action begins at 9 am PST on April 6 and runs until 4 pm PST on April 10. Unfortunately (and rather ironically, given that BioWare is based in Edmonton), the Bazaar is only open to residents of the U.S., minus Florida and New York, which I guess are kind of like the American equivalents of Quebec. Full contest rules, a complete list of prizes and all the other details you'll need to know are available at social.bioware.com.